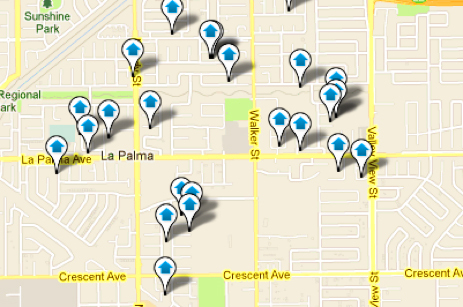 Want to know more about La Palma homes for sale? Located in northern Orange County, nestled between Cerritos, Cypress and Buena Park is one of the top places to find live in Orange County, the city of La Palma. La Palma is only 10 miles inland from the beach and 20 miles east of downtown Los Angeles making it an easy commute for many residents. This diverse Orange County city also has an exceedingly low crime rate. All three of the cities primary schools have free after school fitness programs; it’s easy to see why it was ranked no. 64 by Money Magazine as one of the top 100 cities to live in the United States. Money Magazine based their list this year on smaller places that have the best economic opportunity, safe neighborhoods, schools, activities and a sense of community. The median selling price for orange county homes, in spring of 2011, for La Palma was $500,000. The average rent for orange county rentals is $2,185, that’s $1.20 per sq. ft. This is pretty standard for real estate in North Orange County. Hanam City, South Korea is La Palma’s first sister city unanimously voted by the La Palma City Council back on August 5, 2008. La Palma’s 2010 Census report stated that 5,224 Orange County homes were owner-occupied and 1,432 Orange County properties were occupied by renters. The total area of La Palma is 1.82 square miles. This makes La Palma the smallest city in Orange County, in terms of area. La Palma’s largest top three employer’s in 2010 were ADP, La Palma Intercommunity Hospital and BP West Coast Products; creating many employment opportunities. Please contact us at (714) 469-8198 if you have any questions regarding La Palma homes for sale or anything Orange County Real Estate related.